Little girls love pretending to be grown-ups, and what better way than with fancy tea party? 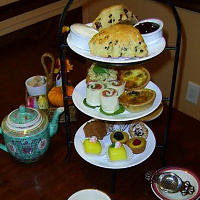 FunNewYokr.com has found the best tea parties in NY. During the party, they will enjoy cookies, cake and drinks served in a real tea set! 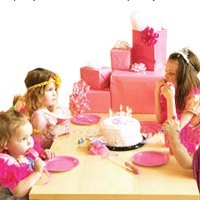 See more of the best tea parties for children in New York at KidsParties.Party, a helpful online guide to kids birthday party planning. Fancy NY Tea Party with Dress Up Included! 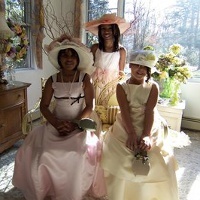 Little girls will have a great time at this Victorian style tea party. Lady Victoria and Lady Valerie, the party hostesses, will bring a chest filled with dress-ups and accessories for all the party girls. 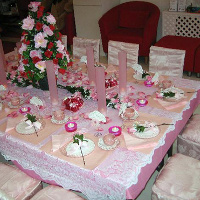 They will then lead all the little ladies in a proper tea party at the beautifully decorated tea party table. Proper etiquette will be taught to all the ladies, and they will enjoy a first course of tea sandwiches, fruits and veggies along with iced tea or juice. After tea time, a craft or game will be led by the hostesses and then special dessert course will take place at the tea table. Your little girl will never forget the New York tea party you throw her for her birthday. Alice in Wonderland Style Tea Party! If you are looking for a special experience to give your little girl, how about throwing her a magical tea party at Alice's Tea Cup? This small tea shop is perfect for your daughter and her friends to have afternoon tea in style. When you book your party here each little lady can come dressed in her best and will be served sandwiches, chocolate mousse, and tea or chocolate milk. This shop is decorated in an Alice and Wonderland theme, giving the place a magical atmosphere. If you wish to complete the theme you can opt to have a Mad Hatter, magician, Alice face painter or Alice storyteller to attend the party. High Tea in Style at this Tea Room! 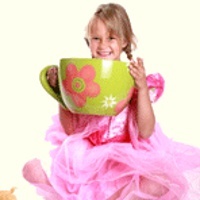 When you have your daughter's tea party at La Tea Da she and her friends will never forget that special day. La Tea Da offers a choice of two different girls birthday tea packages. When you choose the Lady Hamilton's Tea each guest can come dressed in her best floppy hat and feather boa - the little ladies will be served a choice of drink in a fine china tea set and a variety of finger pastries. The Lady Grey's Tea, includes dress up clothes for the guests as well as fine china and linens for the tea table where they will be served sandwiches, tea pastries and their choice of drink. Unforgettable Tea Party with Friends! This great tea company offers tea parties that will come to your location or party venue. When you choose one of their tea party options your child and guests will get to dress up in fancy outfits and enjoy high tea in elegant style. Choose from add-ons such as a craft, games or stories for after teatime. Not only does Modern Tea with Company LLC do great children's tea parties, this NY tea party company also can run tea parties for adults, clubs and social gatherings and can do educational presentations about tea for groups and clubs. Dress Up, Make Up and Tea Party! 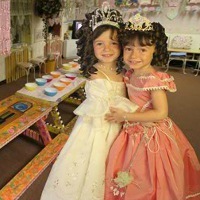 This party place on Long Island offers several types of party packages that are sure to delight your little girl. When you choose the "Her Majesty's Princess" birthday party your daughter and her guests will all get royal treatment, with up-dos for their hair, makeup application and manicures and pedicures all to get ready for a runway walk and tea party. The tea party will take place in the Tiny Teacups Cafe and will be followed by a disco dance party. The girls will have a blast eating and drinking while feeling their fanciest. Tea or Ice Cream Parties in a Patisserie! This patisserie in Brooklyn offers a special children's tea menu for kids parties. When you have your daughter's tea party birthday party at Sweet Melissa all the girls will get to dress up in outfits and accessories from the special "dress-up chest" before having tea like little ladies. 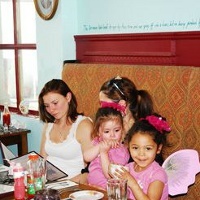 The children's menu includes scones, finger sandwiches, small desserts and a choice of beverage. This 2 hour long party will be great fun for all as they use their best manners and tea etiquette just like grown-ups. There are also options for an ice cream party at Sweet Melissa if you'd like to throw your little lady an ice cream social instead of a tea party. Tea Party for Little Ladies and Gentlemen! This music school turned party place hosts dainty and elegant tea parties in NY. If you book the 90 minute Princess Tea Party the guests will arrive to a charmingly decorated party room and a tea table set with beautiful linens, finger sandwiches, cakes and juice served from a tea set. After dressing elegantly in boas and accessories from the dress-up chest, the girls will be led in a manners and etiquette lesson and then will take tea. If young gentlemen will also be attending, choose the Black and White Formal Affair party package where tuxedo dress-ups are also available so the boys can join the fun as well. Tea Party from a Fairy Tale! Have your daughter's party at the Museum of the City of New York where, before and after the party, the children can explore the museum and learn about a wide range of topics. At this great museum you can book a "Fabulous Fairy Tale Tea Party" for your little girl and her friends. All parties at the museum are great for kids 2-9 years old and are run by Piece of Cake Parties, professional party coordinators. There will be fun dress-up games, a make your own castle coin bank craft and tea service where each girl can decorate her own dessert. The girls will love this unforgettable tea party. Garden Tea Party in New York! 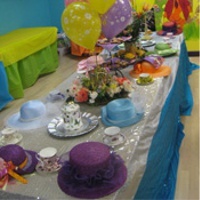 When you have your daughter's Victorian tea birthday party at Kiddie Wonderland it will be an event she will never forget. The guests will be welcomed to a beautifully decorated tea room where the part will take place. An elegantly set table with a real china tea set which will make the girls feel extra grown up! The birthday girl and her guests will learn proper etiquette and how to have manners like a little lady as well as interesting tea time facts. 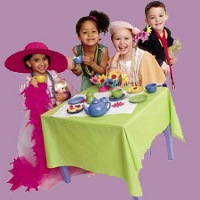 Fun tea party games and dances will follow tea time and make the party unforgettable.